From the first episode, I knew OITNB would use food creatively. They roast a whole pig on her last night before prison! I knew I was definitely not wrong when Piper got a tampon breakfast sandwich on her first day (I think??) in jail. I've been wanting to make something from the show for a while, and have a lot of options, but I'm behind and a friend of mine suggested I make Flamin' Hot Cheetos based on a story arc from the current season. You don't have to worry about spoilers because I need to catch up and only know what I've read for context that the governor sent a goodwill gift that included the spicy snack in a shipment. This is yet another experiment in making store-bought things homemade and I'm not sure if it's worth the effort, but they were tasty and the coating would definitely work as a versatile seasoning for a lot of snacks (it was originally intended for popcorn). Silicon Valley is one of those shows that's amazing and you are always reminded as soon as it's back and you can't wait for next week's episode. I love this episode from the first season, where awkwardness and tensions are high and we still don't know the characters and world so well. Eccentricities are common amongst the people in the world, and this scene with Peter Gregory and everything on the menu from Burger King was so memorable, I thought I had to celebrate the return of the new season of the show with the real subject of that scene. They seem kind of random on their own, but who doesn't keep a few buns on reserve in the freezer for burger night or one of those nights that you just have to go with a frozen veggie burger. I already had all the ingredients for these, so on one of those days, why not go with something homemade? The first time I was made aware of Tracey Wigfield was when she was on stage with Tina Fey to accept an Emmy for co-writing and episode of 30 Rock. It prompted me to do a deep dive into her background, and shortly after I was made aware through Mindy Kaling's Instagram that she had been recruited to be a part of her writing staff when 30 Rock was coming to an end. I then followed their friendship and her eventual sale of her very own Tina Fey-produced comedy and its making on her own Instagram. I find her hilarious, and some of her 30 Rock episodes are the funniest of the series, so I'm optimistic about her new show, Great News, which premieres next week. To celebrate, I decided to make a familiar favorite from one of the episodes of 30 Rock that she wrote. Oreos are one of my all time favorite foods, and I've been wanting to make homemade ones for a long time. These were so much easier than recipes I've found in the past, and they were a big hit with all 6 people who finished them in about 24 hours. It's not hard to identify with Liz finishing the half sleeve of Oreos she was bringing to Jack's house for Christmas in the cab on the way. Breaking Bad had people wishing Los Pollos Hermanos was as pervasive as McDonald's, and Gus Fring was an amazing stoic villain. We're getting more of him on Better Call Saul, and there's lots of publicity to go with it (it's even coming to life!). Although that restaurant seemed more like a bone-in chicken type of joint, I was in the mood to eat some tenders. I'm not shy about my dislike for cooking with hot oil, so I dove yet again into oven frying. 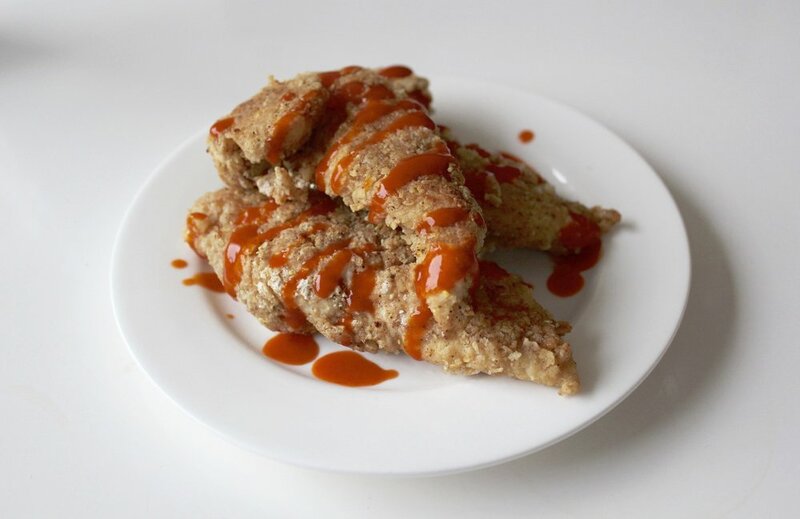 I found this great easy recipe that's practically fast food (minus marinading time), and they taste just as good as anything you'd get off a restaurant menu. TV is funny because it's creating little realities that many times seem to exist in a parallel universe, one that includes food and brands that don't exist in our world. Sure, we're used to really obvious and maybe less obvious product placement at this point, but it's more fun when things are made up, or in this case, a TV industry-wide inside joke. There have been a few different stories (and even a now-defunct blog) about the famous Let's potato chips that pervade TV—spanning networks, genres and decades, and it's fun to compare how the fictional brand is used in different fictional worlds. This Is Us ends its first heart-wrenching season tomorrow, and it will no doubt be an event that requires comfort food. I knew the second the episode where Kevin [SPOILER] starts to try to get Sophie back that I would need to explore this concept of lava fries, especially ones that have the power to make an ex-wife take a seat instead of walking out in the MORNING. My first thought was that Kevin for sure does not eat fries, but creative license. My first FOOD thought was that they are probably chili fries, but that is pretty played out and the concept of them kind of grosses me out. I thought that they needed a little spice and maybe even a bit of a makeover, so I baked the fries for hot oil-avoidance and explored the best complementing flavors possible. Also I meant to add parmesan cheese before the pics and forgot but just know it is MUCH SUGGESTED.